Flash forward to 2018. 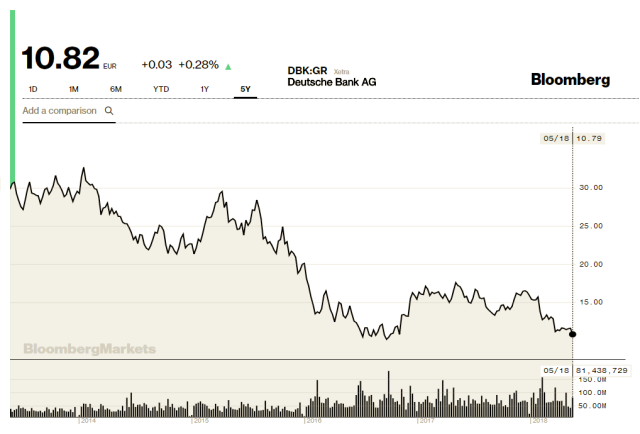 Perennial too-big-to-fail problem child Deutsche Bank is close to seeing its stock fall into the single digits, sounding alarm bells reminiscent of when Bear Stearns collapsed and was acquired for $2/share, and when Lehman Brothers imploded and went out-and-out bankrupt. The connection? Deutsche’s CDS book runs to approximately $157T, yes trillion, or roughly twice the GDP of the entire world. The exact threat level this poses to the bank, the stock market, and the global financial community at large is not clear. What Is a Credit Default Swap, Anyway? Understanding what this derivative is might help with understanding the current situation. Investopedia defines a CDS as a type of swap that splits credit exposure on bonds and securities between multiple parties. The buyer(s) make contracted payments to the swap’s seller, and the seller agrees to compensate them if the debt issuer defaults. In effect, a credit default swap is betting on the probability of default. And when you’re betting on risk, there’s going to be a risk in return. We saw this with the collapse of Bear Stearns and Lehman Brothers, along with the bailout of AIG, all of which stemmed from the buying or selling of CDSs. The credit default swap rates for banks declined in the years following the Great Recession — but as we can see from Deutsche Bank, at least one institution is full steam ahead. So What Will Happen to Deutsche? Part of the problem with knowing what effect the current situation will have is that these credit swaps are relatively new to investing. In fact, according to CDC-Info, they only came into existence in 1994 at JPMorgan (which is now doing a new dance when it comes to silver pricing). The cataclysmic events of 2008 are therefore the only major historical data point we have so far. But if you found out that a community bank in Iowa had financial commitments valued at twice the GDP of the United States, would their constant assurances not to worry about that little detail put you more at ease? How small would even an innocent mistake need to be, at that level of liability, to trigger a potentially lethal cascade of chain reactions?